The way you build your personal brand tells a lot about yourself. LinkedIn is a great tool to help you strengthen your presence on the market and expand your network. There are various LinkedIn profile best practices you can use to increase your business development. Some of them can be implemented right away while others will take a bit of time to show their efficiency. Keep reading and discover how powerful it is for businesses and which are LinkedIn best practices in 2018. Have you ever wondered why is LinkedIn so powerful for B2B businesses? First, according to the latest estimations, there are approximately half billion people using this network. Therefore, it is easy to imagine that there are 500 million people with whom you can connect and share your ideas. Part of them are your future clients and partners. It worth mentioning that 61 million LinkedIn users are considered to be senior level influencers and over 40 million of LinkedIn users are in key decision-making positions. – 80% of B2B leads are generated by LinkedIn compared with 13% on Twitter and 7% on Facebook. 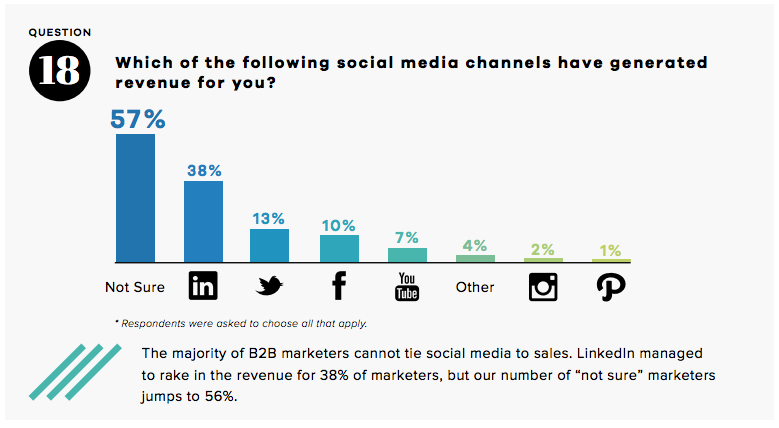 – 38% of marketers active in B2B sustain LinkedIn generates revenue for the business they market. Moreover, LinkedIn is appreciated as high-quality source of content. This makes users become very engaged when using it and count on it in their business decisions. Even though it is a valuable resource for any type of business, this doesn’t mean that success is guaranteed. If you really want to have a competitive advantage when using LinkedIn, you need a forthright strategy. Since it is a marketing channel that can change the face of your business, it should be granted special attention. · Develop SMART goals for your LinkedIn strategy. Just like in any marketing strategy, your goals should be specific, measurable, attainable, relevant and time-based. · Reach the right audience. LinkedIn offers you various demographic data which can help you develop specific audience segmentation. Therefore, it will become very easy for you to personalize your messages and grow your audience. · Create the right messages. Your messages should give answers to your clients’ questions and provide solutions to their problems. Now that you got yourself familiar to what LinkedIn means and how it can help you, let’s dive into more details. Use the strategies below and get ready to revamp your business. The first thing your clients and business partners see when they want to know more about you on LinkedIn is your profile. It is your business card and it should show you on the best light possible. So, you need to pay close attention to the way you present your business, your story and services. Your profile picture and background photo are extremely important for the first impression. LinkedIn best practices for personal profile encourage you to use recent photos, not exaggerate with powerful colors and use symbols that represent you. As long as you don’t complicate things too much, there’s nothing that could go wrong. · Attach a ProFinder Badge to your profile if you are a solopreneur or just starting up. Another remarkable thing about LinkedIn is that it makes very easy for its users to publish articles. However, if you think that you will write some promotional content that will sell your products immediately, you are totally wrong. The people who are using LinkedIn are not interested in just another promotional post that encourages them to spend their money on a specific product. LinkedIn users are rather more interested in how your products will help them solve their problems. They have several questions for which they hope to find the right answers by reading your articles. So, you should focus on educating your customers and give them practical solutions to their problems. This is how you build your brand’s credibility and show that you are an expert in your field. You have the possibility to create niche pages related to your main Company Page via LinkedIn Showcase Pages, highlighting specific products or a targeting specific audience. This helps you personalize user experience and communicate more effectively, as users have the possibility to follow just a showcase page, not the main page of the company or other showcase pages that your company might have installed. There have been many studies revealing that humans react better to visual context. We are visual creatures which makes us understand visuals a lot faster than any text. Thus, if we apply these findings to the internet world, it is already a fact that visuals get more views than content. So, this is one point you should focus on in your LinkedIn strategy. One of the LinkedIn best practices in 2018 which will continue to be successful the following years too, is using infographics and charts in your articles. Your readers will find it easier to understand the information and remember it when they need it in the future. So, if you already applied this strategy last year, you should continue using as much visuals as possible in your content. Keeping your audience engaged and enticing her curiosity concerning your products is tough job. Taking into consideration the soaring popularity of videos, you can use them to convince your prospects to return. Furthermore, it’s easier day passing for your clients to be able to watch videos from their desktop or mobile devices, no matter their location across the globe. · Create a video story of your brand. No one sustains that LinkedIn is going to bring incredible results overnight. It takes a lot of consistency and hard work to show your clients that you are a reliable business owner who puts them on top of his priority list. Therefore, you should pay attention to keeping your content fresh. The publishing frequency is also important. So, if you post a new article at least once per week, then you are on the right track. In addition, try to always be the first who announces your loyal customers when something new appears in your niche. You will see that all these efforts will pay off in the end. Your employees can become your strongest partners in promoting your business. Who else can better promote your products than your employees who know all details about them? LinkedIn best practices encourage entrepreneurs to listen to their colleagues’ ideas and publish them. Sharing your LinkedIn strategy with your employees will help you grow your business presence in your industry. This is a good approach if you want to show your employees that you care about what they think, and you want to make them part of your business. They will become more loyal to the brand and be more open to contribute to your business’ growth. So, adopt a smart strategy and accomplish a double goal: grow your employees’ productivity by listening to their ideas and strengthen your presence on the market. · Your visitor’s demographics. You will know everything about the people who visit your page: where they live, which are their jobs, how old are they, etc. · The number of page views during a specific period. · How many unique visitors you had during the analyzed period. · Identify what your competitors are doing and how their metrics look like. · The number of new followers acquired. If you belong to the LinkedIn Business Solutions category of clients you benefit of Content Marketing Score and Trending Content resources. The Content Marketing Score provides you with insights related to the user engagement on your sponsored posts, pages, groups or Influencer posts if the case. And also showcase recommendation to implement in order to improve your numbers and the results of your LinkedIn content. In case your budget allows it and you want faster results, then you can use LinkedIn ads to amplify the power of your content. LinkedIn offers you a bunch of features allowing you to target and refine the audience you want to communicate your message to. For instance, you can target specific job titles or industries. Therefore, your messages reach exactly the type of persons you need in order to grow your business. Creating a group can be a smart decision only if you have a strong number of followers who will form a solid foundation. People look for evidence before they join a group. Therefore, you need to count on your connections who can convince new followers to become active on your group. And of course, you need to be aware of your competition. There are many groups on LinkedIn, in fact too many, especially promotional ones. This means that you have a mighty competition. If you want your group to be successful you need to bring a new and interesting idea on the table. Moreover, apart from promoting your products, you need to create discussion topics and encourage people to share their ideas. By the end of August 2018 LinkedIn plans to release the new version of LinkedIn Groups, that will integrate into the main site and mobile apps. The main purpose of this revamp is to make Groups more user friendly and more engaging and to reintegrate Groups into the prime LinkedIn experience. As consequence Groups will benefit of an admin functionality and will have the capabilities of being managed via Android or iOS apps. So, if you are planning to have a group on LinkedIn this is a great moment to start. If persons from your connections list take some minutes to say something positive about your business, then you should show them how much you appreciate it. Always leave a comment when you receive a feedback from one of your connections. If the person who commented is not in your connections list, then this is a fantastic opportunity to connect with them. You can also stand out by replying to the people who send you a connection invite. People are so busy with their activities that they don’t pay so much attention to the power of these small actions. There is no doubt that LinkedIn is a powerful tool which can boost your business. These best practices will help you use your talent to its fullest potential and show your clients that you have something to say in your niche. If you use this platform for your personal profile, you can also apply the tactics listed above. LinkedIn is great when you want to stay updated with the latest trends in your industry. Implementing a LinkedIn strategy is definitely not as difficult as it might seem at a first glance. It is a powerful tool for those who want to leverage their business. These practices show you that this is an achievable goal. The above-mentioned LinkedIn best practices in 2018 will help you build a stronger profile and reach more customers than ever before.